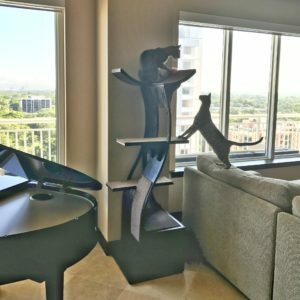 The Lotus Cat Tower has been on the market since 2005 and has received a few notable design upgrades. In response to several user complaints about defective parts making assembly a nightmare, The Refined Feline changed their manufacturer and improved their quality control procedures to mitigate this issue. The second design upgrade was adding a brace to improve stability. 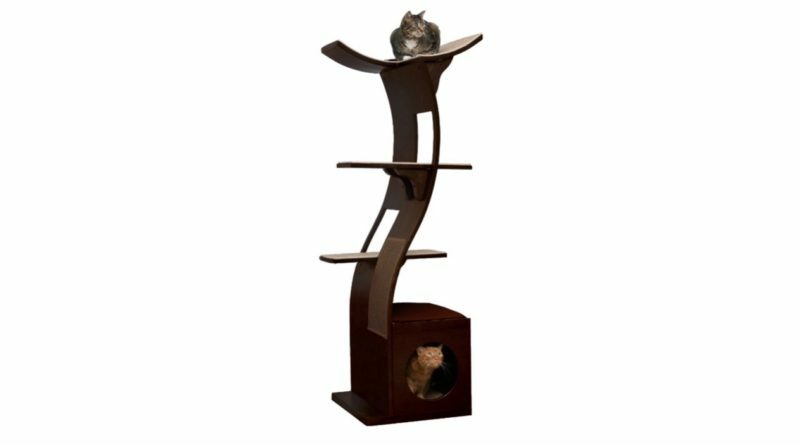 The Lotus Cat Tower stands 69 inches tall and has two stepped shelves that lead to a large platform on top. 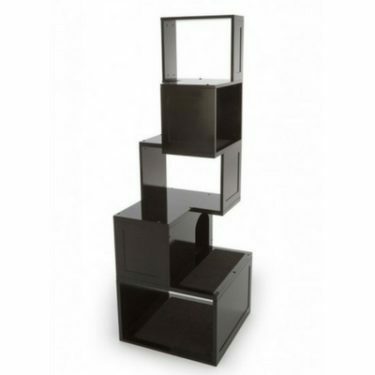 A boxed cubby at the base provides an excellent hiding spot for cats and stability for the tower. All surfaces are covered with easily replaceable carpet pieces or cushions that are Velcroed on. 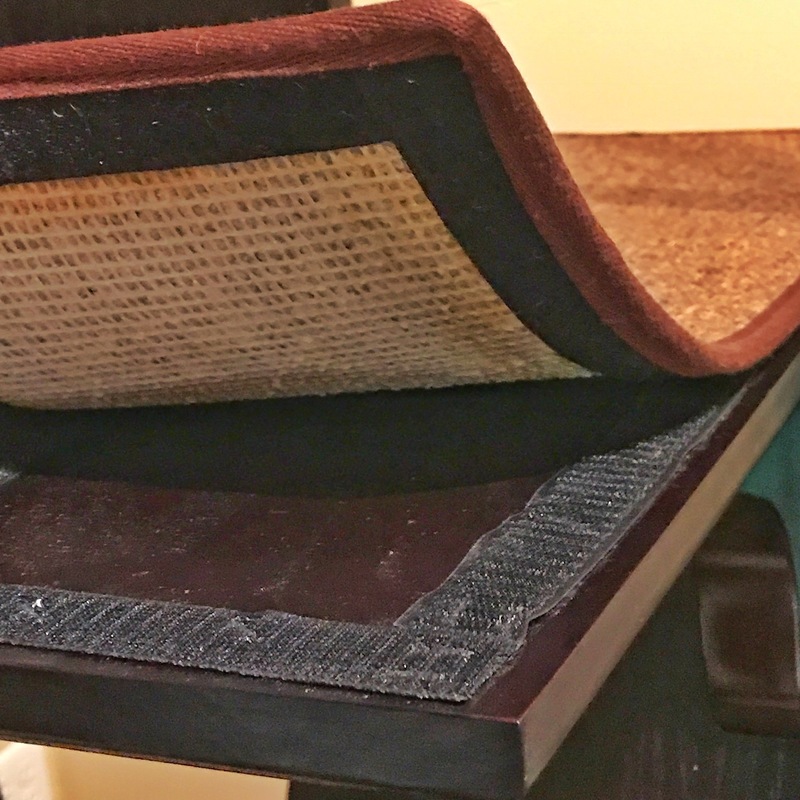 A 20-inch sisal scratching post is built into the side for added functionality. 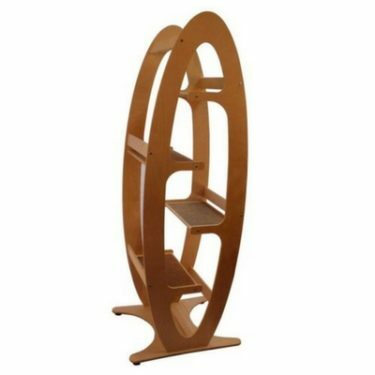 The tower is made of ply with oak veneer and comes in two finishes, Mahogany and Espresso. Top Platform Dimensions: 20” x 20” approx. 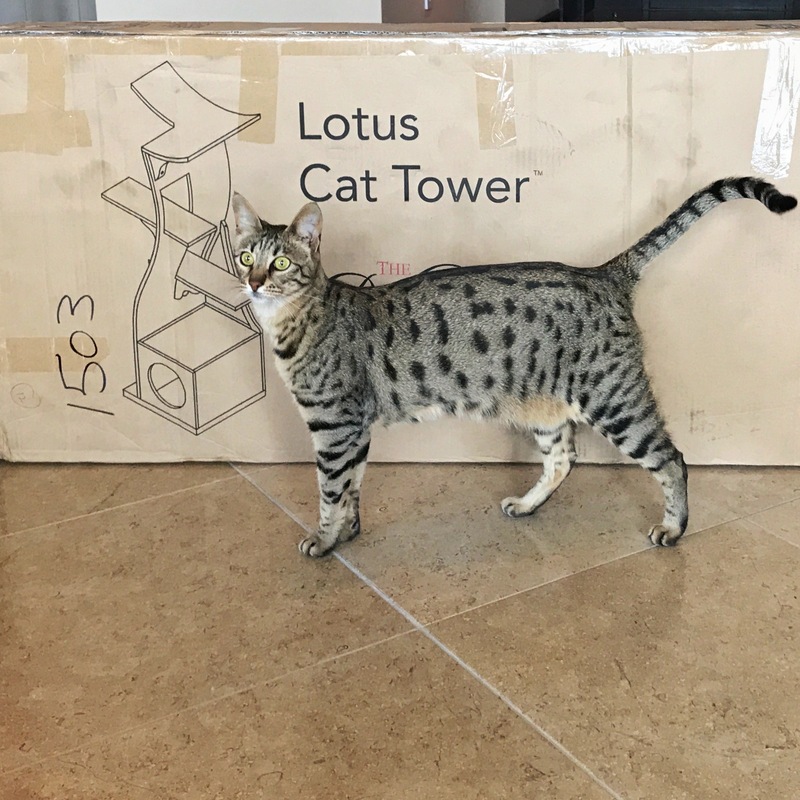 The Lotus Cat Tower is shipped with about 20 pieces and requires assembly. 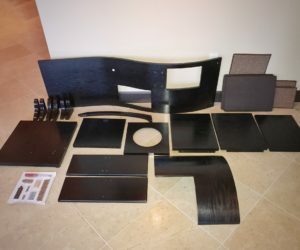 Assembly is very straightforward and can be completed in an hour using the screwdriver that is provided. Having a power drill isn’t necessary, but would speed up the process. The Lotus Cat Tower Assembly Instructions can be found here. The Refined Feline has succeeded in creating a cat tree that is visually appealing to humans! The flowing, curved design is made to resemble a flower. 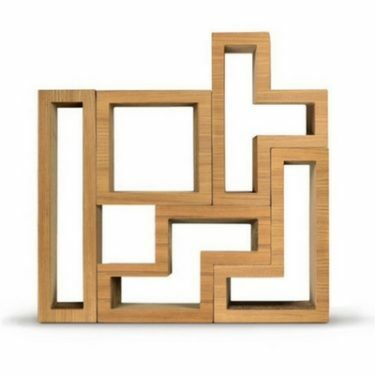 The artistic design of this furniture is attractive enough to be a stand-alone piece of home décor. Now let’s see what the cats have to say. 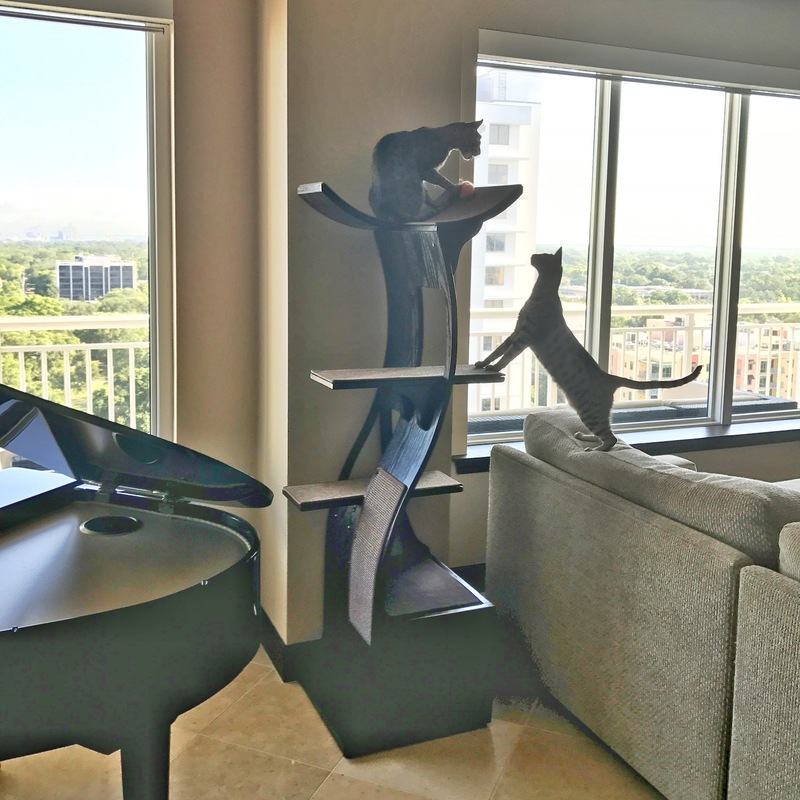 The Lotus Cat Tower has been tested and approved by hundreds of cats, including our very own Arya and Django. Cats like being up high and this tower offers some prime cushioned real estate at nearly 6 feet off the ground. 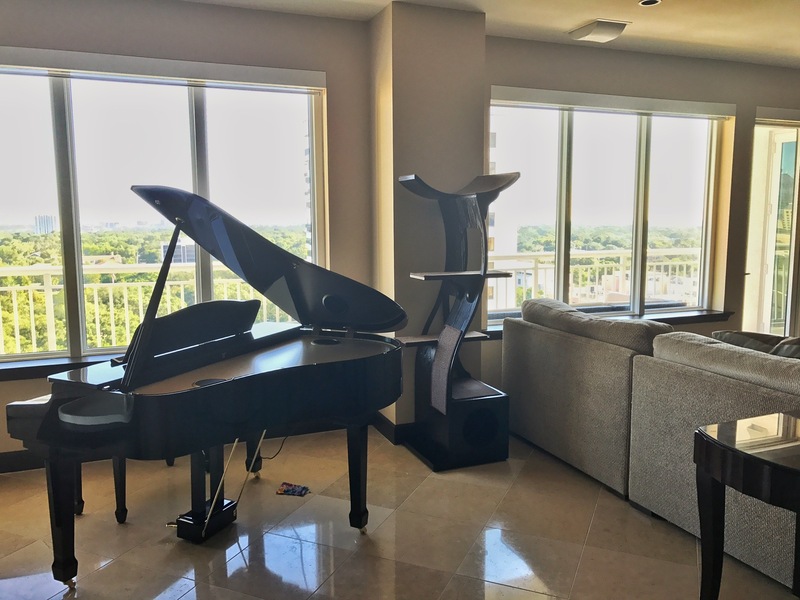 The multiple levels make it ideal for multi-cat families. And if your cats are anything like mine, they will constantly be fighting for that top spot. 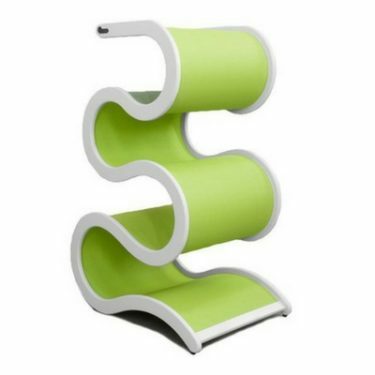 The carpeted shelves help your cat maneuver through the tower without slipping. 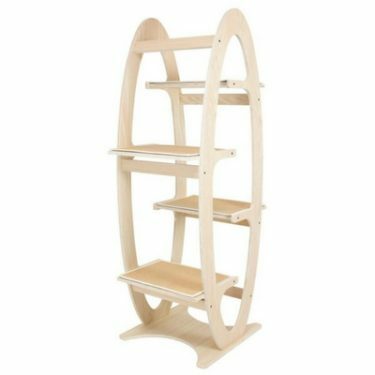 While the intermediate shelves are on the smaller side, the top perch is quite large. So even if you have a 20-pound large kitty, they’ll most likely be able to fit through the openings to get to that top perch. The same goes for the cubby at the base of the tower. 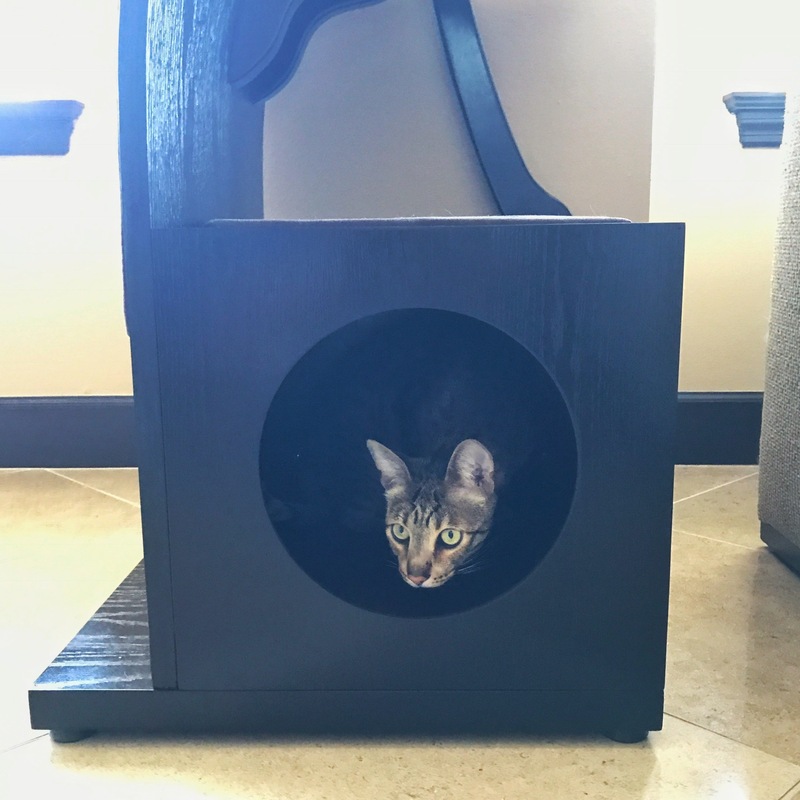 The 9.5-inch diameter cubby opening is plenty big for even a large-framed Savannah cat like Django. 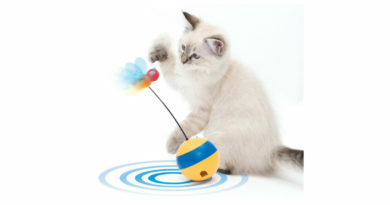 The 20-inch replaceable sisal scratching pad is a nice addition if your cats prefer vertical scratching posts. It’s long enough and placed at just the right height for cats to get a full stretch in. The design of this particular cat tree isn’t ideal for stability. When you have multiple cats jumping on and off, you might notice that it wobbles a little. But the wobbliness isn’t enough to deter most cats. 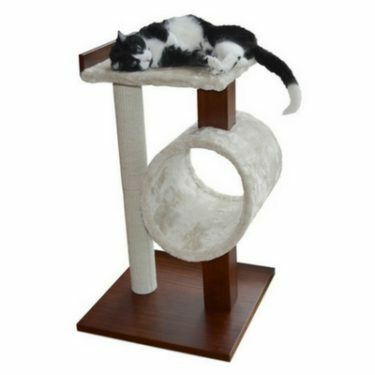 This cat tower is heavy and with the weighted base, it would be nearly impossible for a cat of any size to knock it over. So from my perspective, a little wobble is completely harmless. 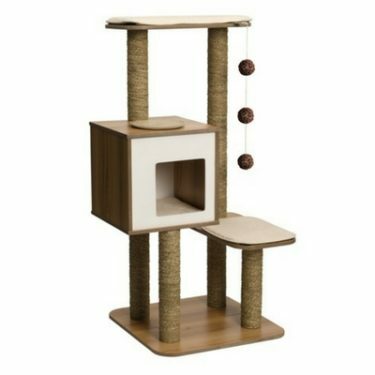 The Lotus Cat Tower is one of the highest quality cat trees that we’ve come across. 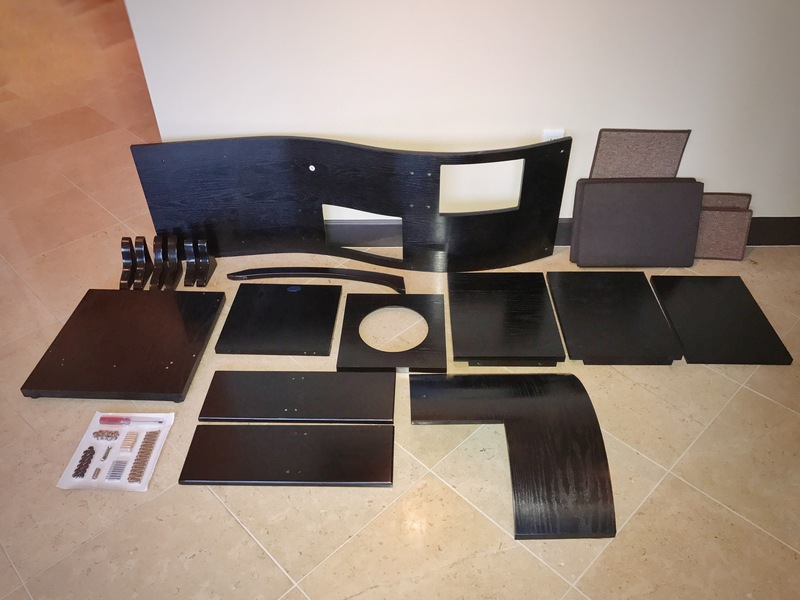 The materials used are durable and a lot of attention went into the design and functionality of this product. This cat tower is definitely cat-owner friendly. The Velcro cushions and carpet can easily be removed, washed, and replaced. Even the scratching pad is replaceable. 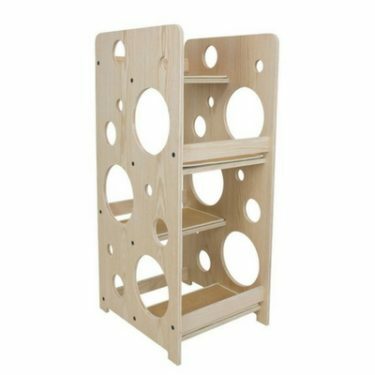 The cubby at the base has a removable top, which makes it convenient for retrieving a hiding kitty, or your collection of cat toys. 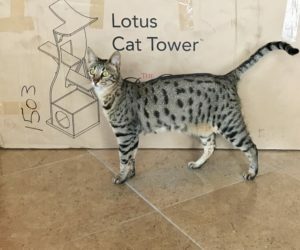 The Lotus Cat Tower has both quality workmanship and quality design. 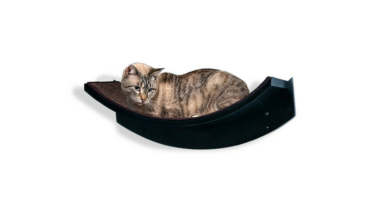 The retail price of the Lotus Cat Tower is $370. In addition to being our top rated cat tree, the price also makes it one of the most expensive. 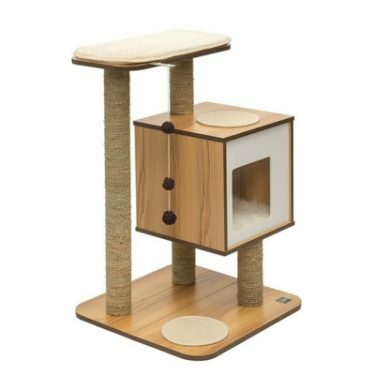 We expect the price of these modern cat trees will come down in the future as more competition is introduced. 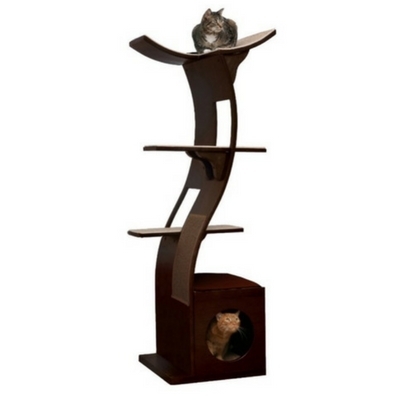 But for now, if you want the best modern cat tree out there, be prepared to pay a hefty price for it. There is very little room for improvement with this particular cat tree. It covers all the bases and then goes the extra mile to incorporate several user-friendly features. The only improvement I’d recommend would be widening the intermediate shelves and increasing some of the crawl-through openings. 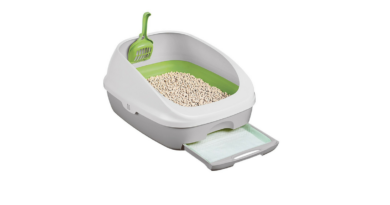 This would make the tower a bit more fat cat-friendly. I think this could be accomplished without adding too much bulk or altering the aesthetic.